The game plays over the course of four rounds representing the four months (June-September 1692) in which the hysteria was at its height. Each round has two parts: a Witch Hunt and a Witch Trial, followed by hangings (the dates of which correspond to the four actual hangings that took place in Salem that year). During the Witch Hunt, players send residents to jail and provide alibis for their own jailed citizens. At the end of each round all jailed citizens stand trial. Players then collectively decide who is hanged and who is spared. The player who is most successful at discerning witches from villagers wins! 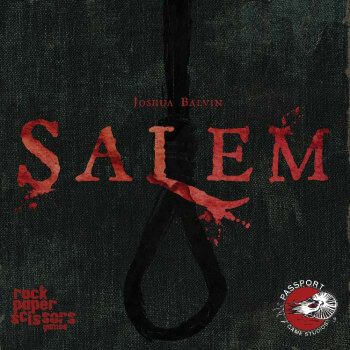 In an atmosphere of pessimism and charged paranoia the citizens of Salem are at the mercy of demons. What began as a devout Puritan community devolved in a matter of months into a people torn apart by fear, lies, and fanatical orthodoxy. The residents of Salem quickly discovered that they could find Hell all around them.